Thank you to everyone that participated in our poll regarding time wasted searching for tools. Here are the results. 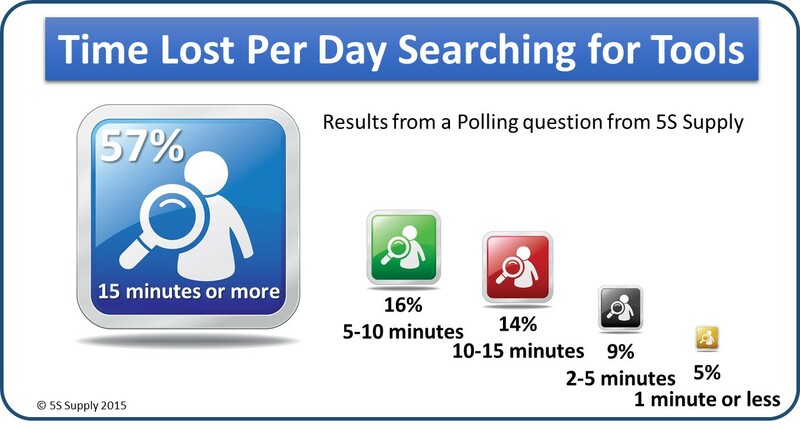 Greater than 50% of the respondents said that more than 15 minutes is wasted per day (per employee) searching for tools. That time adds up quickly. Let’s say you have five technicians losing 15 minutes per day searching for items they need to do their work, which equals 75 minutes per day, or 735 hours per year. If you take the 735 hours at $20 per hour, that is equivalent to losing $7,500 of productive time(1). A simple way to reduce this waste of time, effort and dollars is to get the tools organized. Something as easy as using Tool Tracer Peel and Stick Tool Shadows can reduce the time lost searching for items. Check out Tool Tracer at 5S Supply.com. Note (1): Based on 5 days per week and 52 weeks per year. Feel free to use your own number to complete your calculation. Please help us with another quick, one question poll “Does Floor Marking Improve Productivity and Safety?” We will share the results. And please share the poll with your co-workers and colleagues!